Ms. Piccante Dolce has stopped back in and I thought I'd share with all of you divalicious readers a super easy and elegant dessert. One of the cornerstones of this is the vanilla sugar, a simple thing to make and a great thing to have in your pantry. I made it a week ago and have thrown it into many of my desserts since then, even into my tea. To read how to make it check out my recent post for my Vanilla Bean Cardamom Peach Pie. 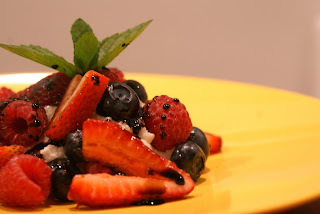 With the summer berries just starting to come into season, I wanted to make something that highlighted them, but with a modern twist and that is of course delicious and impressive too! I think I found the perfect combination of all of those things with this dish. 1. Mix ricotta and vanilla sugar and place in the refrigerator to cool. 2. In a small saucepan bring balsamic vinegar to boil over medium high heat. Lower heat and simmer vinegar until reduce by at least 1/2. Mix in sugar and let cook to a syrupy consistency. 3. 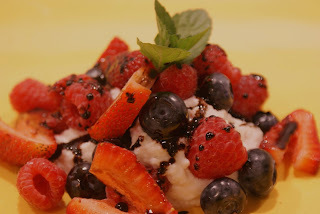 Spoon 1/2 cup of ricotta onto a plate, top with 1/2 the berries and drizzle with balsamic syrup. There you have it, a delicious and easy summer dessert! Perfect for those disgustingly hot days when you don't want to bake something extravagant but still want to impress. You can even make the balsamic syrup on the grill, if you'd rather cook outside. 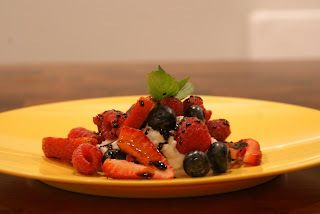 It's also on the healthy end of dessert with the part skim ricotta and fresh berries and not too much sugar per serving, for those that are keeping track. Enjoy!